Windows Phone is dead. Long live Windows 10. And right now, there’s not that much else to get excited about aside from new flagship phones, which Microsoft execs promised will debut this fall. If Windows 10 is an iterative upgrade to Windows 8, then Windows 10 for phones feels even more so. I think the best way to view Windows 10’s direction, both in mobile devices as well as the desktop, is not so much straight ahead, but laterally: closer together, with each Windows device becoming a more cohesive part of the whole. But that leaves what we’ve seen of Windows 10 a bit bland by comparison, if you’re looking for new features. The mobile version of Maps pulls in data from third-party sources, such as Yelp. Why this matters: Microsoft faces a bit of a challenge here that it seems to be addressing head on. In the recent past, Microsoft embraced the limitations of individual platforms, designing apps optimized for each one. This seems to be a design strategy that Microsoft is discarding in favor of universal apps that simply reorient and “flow” into the different size constraints of various phones, tablets, and PCs. Beyond the keynote—in which Joe Belfiore showed off a nicely organized array of Windows 10 live tiles—Microsoft demonstrated just a few of its new Windows 10 for phones features in a breakout session on Wednesday afternoon. And, really, Microsoft didn’t show off the OS itself, but what it was working towards in the individual Maps, Skype and messaging, Photos, and Outlook apps. 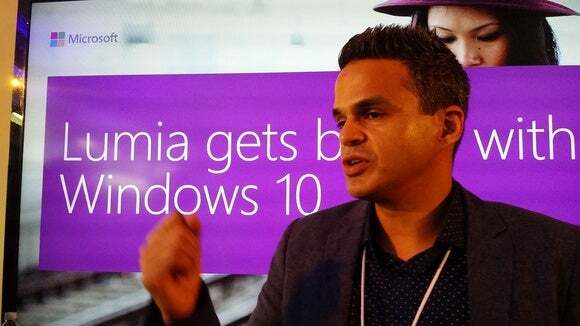 At least the Insider program will be able to take advantage of the new Windows 10 OS for phones in February; a final release date is unknown. The new universal Maps app takes the best of Windows 10’s Bing Maps and takes that into the mobile space. Unity, for example, is the name of the game with the new Windows 10 Maps app, which will be the same for all Windows devices, according to Microsoft executives. 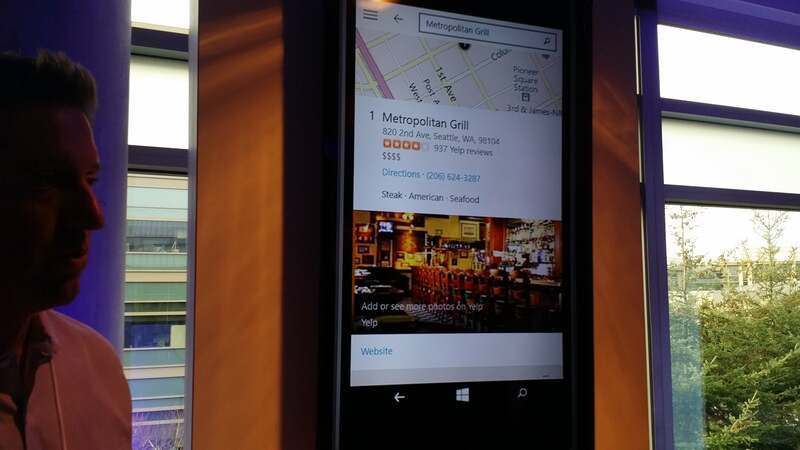 Bing Maps will be plundered for its rich search results, Streetside views, and 3D imagery, and combined with navigation features. 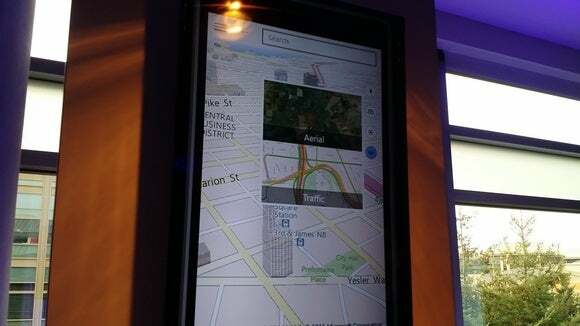 With a tap on a location, users can see the aerial view or the surrounding traffic. Rich search results are pre-populated with common search terms (e.g., “coffee”) and search results yield Yelp reviews and the ability to book reservations via OpenTable. In the new Messages app, Skype and SMS are treated equally. Phone calls, SMS messages, Skype messages, and Skype calls all somewhat overlap. With Windows 10, Microsoft hopes to make a bit more sense out of the rats’ nest of these redundant communications. While Microsoft showed a new dialing hub, messaging seems to be where the focus lies. 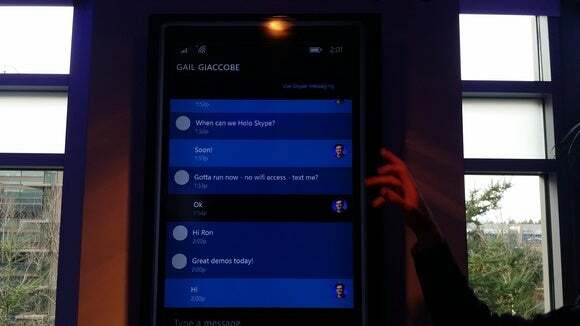 Sure, the user interface is a bit different, but the point seems to be that SMS and Skype messages have the same weight, and appear in the same conversation. Users can also quickly exit a message thread and call the person for a more direct followup. (The related People app will allow you to save a preferred method of communication—email, text, WhatsApp, etc.—for each contact.) Although you can dictate messages via Cortana, you can’t send the short audio snippets that Apple touts so highly with iOS. 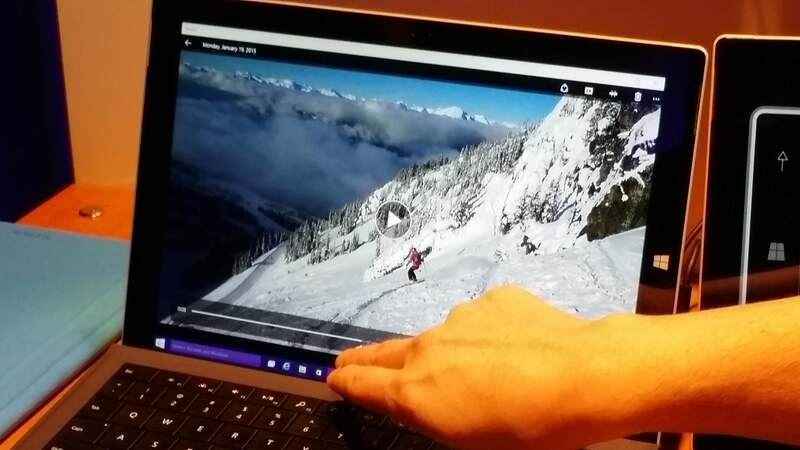 The new Windows 10 Photos app allows you to scrub through video. Although we were briefed the night before on the new Lumia Camera app, Sami Niemi, the man overseeing Microsoft’s photography experience, had a new tidbit of news: all Windows 10 devices will receive then new Lumia Camera app. Aside from that, the new Photos app will also traverse phones and PCs as a universal app, aggregating all the content it finds in new "Collections." One nice addition: The ability to scrub through a video clip, so you can see what part of a movie you’re in without having to guess, begin playing, recognize you’re in the wrong section of the movie, and try again. It’s not certain, but it appears the dozen or so Outlook and Mail experiences on the Web and within apps will be unified. How, however, isn’t quite clear. On phones, Outlook will also call Word—not overtly, with a splash screen, but behind the scenes—to render Word attachments that are included in emails. Interestingly, this was referred to as “universal Word,” an interesting name. 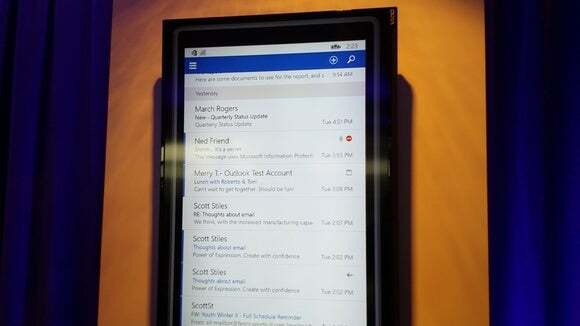 Remember, we still haven’t really seen Microsoft launch a touch-based version of Office yet. Email can be either deleted or flagged by swiping it left or right, respectively, executives said. Again, the theme of the “phones” portion of the event on Wednesday seemed to be less about Windows 10 itself than universal apps. We’d expect to hear more at Microsoft’s BUILD conference this April.